JANE TRASK IS AN ARCHITECTURAL HISTORY STUDENT AT THE UNIVERSITY OF VIRGINIA. A few weeks ago, I participated in Menokin’s Ghost Structure Workshop. Though I could only stay for the first two days, as I had to return to school for my last final, it was an absolutely fantastic experience. 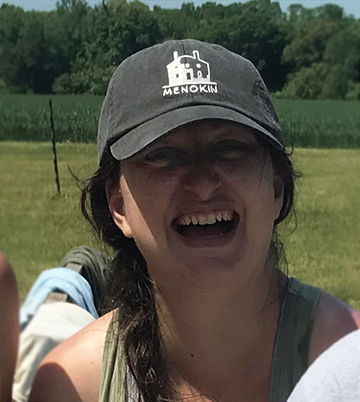 Not only did I get to spend time at Menokin, a site fascinating to me for its unique approach to preservation and presentation, but I also got to use a number of the skills and concepts I have learned over the past two years in UVA’s Master’s of Architectural History program. 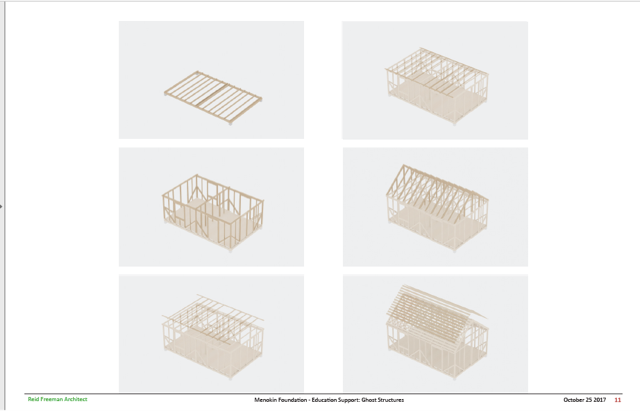 I came away from my time at Menokin with a much better understanding of eighteenth-century construction techniques, slave cabin typologies, and museum interpretation strategies. 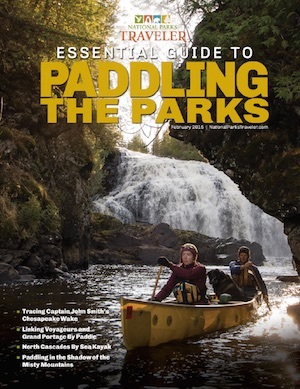 This knowledge will be very valuable to me as I begin my career in the heritage field. The first day, my co-participants and I received an introduction to the project, crew, and tools. Because the goal of the workshop was to erect the cabin in just five days, we utilized a combination of historic and modern techniques and devices. 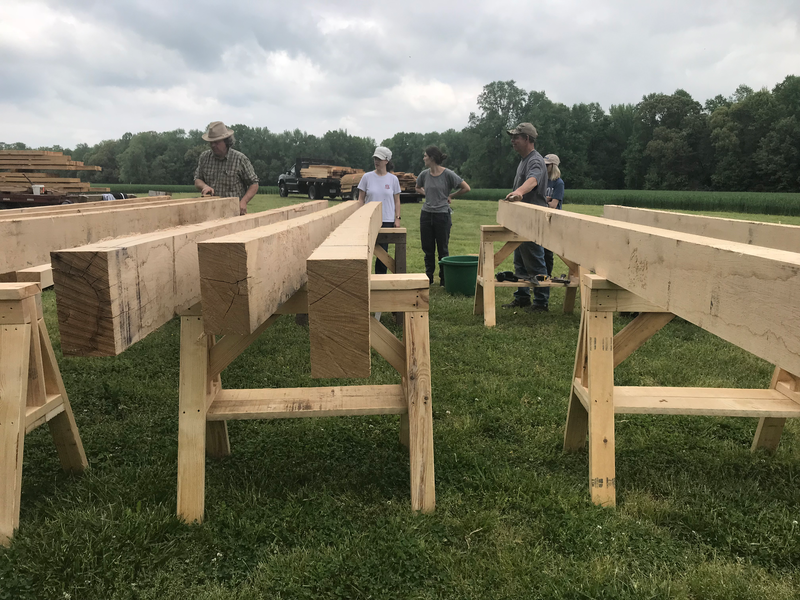 The project was based in historic processes, with a wooden frame fastened by pegged mortise and tenon joints, but the bulk of the wood was cut using power tools so that we could finish on time. This decision demonstrated the importance of balancing exciting ideals and necessary practicality in preservation work and at historic sites. The Ghost Structure Workshop was well-balanced in my opinion. We learned about historic tools and used them for most of the tasks, but modern tools were used for the major pieces that would have taken too much time. By the end of the day, we had the frame of the floor in place. We also spent a great deal of time making pegs for the joints using drawknives on sawhorses. Peg-making looked so easy when our excellent crew demonstrated, but it was so much harder than it looked. A theme of the experience was that everything looked so easy for the professional crew, but it was not so easy for my co-participants and myself! On day two, we got to lay the floor of the cabin. We laid floorboards perpendicular to the joists below and hammered two nails into the surface of each board, tacking it firmly into these joists. 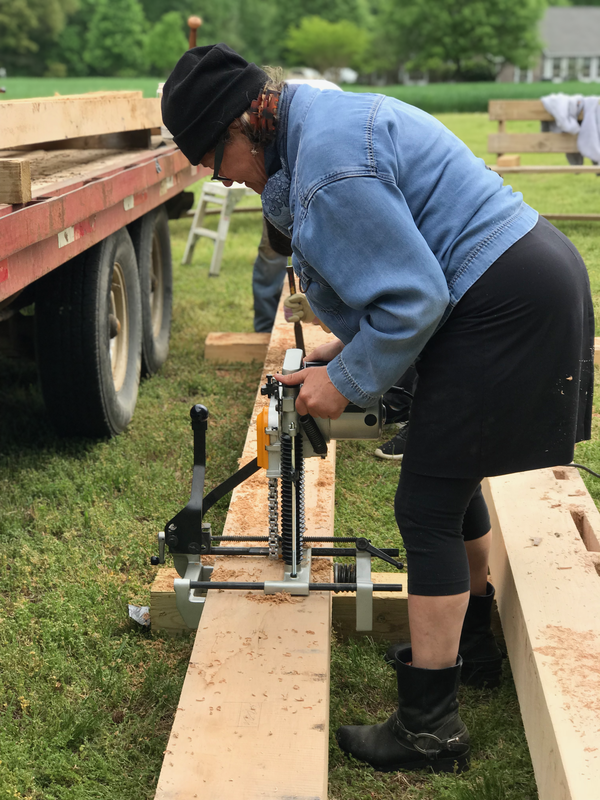 We had to be careful that each floorboard was tight against its neighbor to prevent any gaps in the floor, using chisels to hold the boards together while nailing. This was very satisfying work. 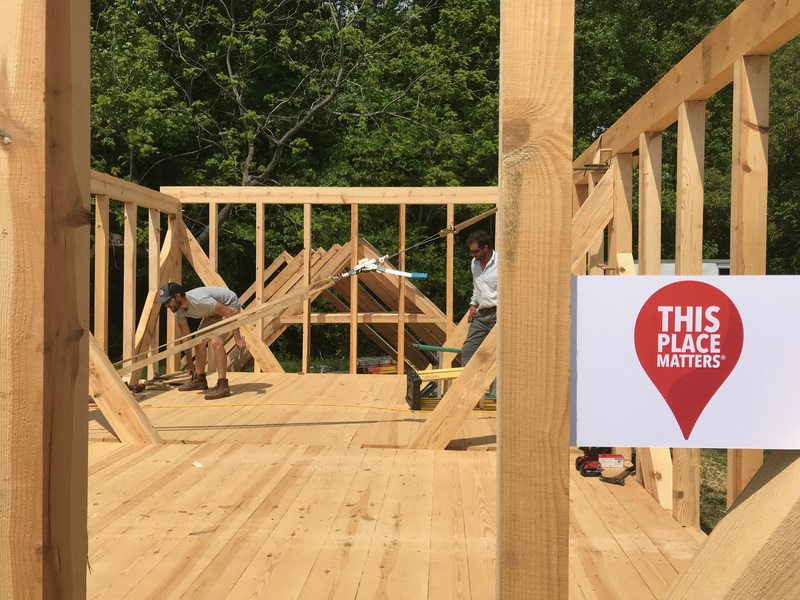 Over the course of a few hours, we saw the collection of timbers and pegs we had produced on day one turn into a real floor and it became possible to imagine what the final product would look like by the end of the week. I really enjoyed my experience at Menokin. 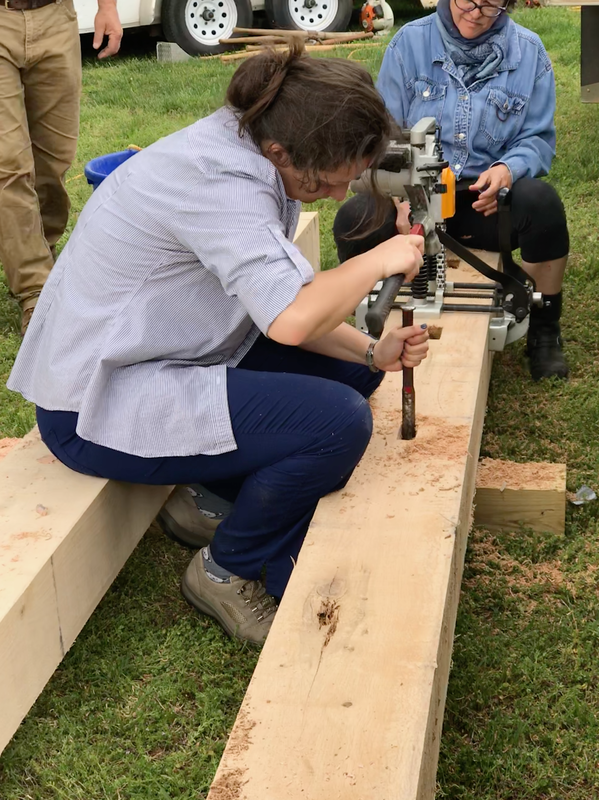 I learned a great deal about the construction process in the eighteenth century, which has been helpful to me so far in my summer internship at Colonial Williamsburg, but I also learned a great deal about the social history of eighteenth-century construction work at Menokin. 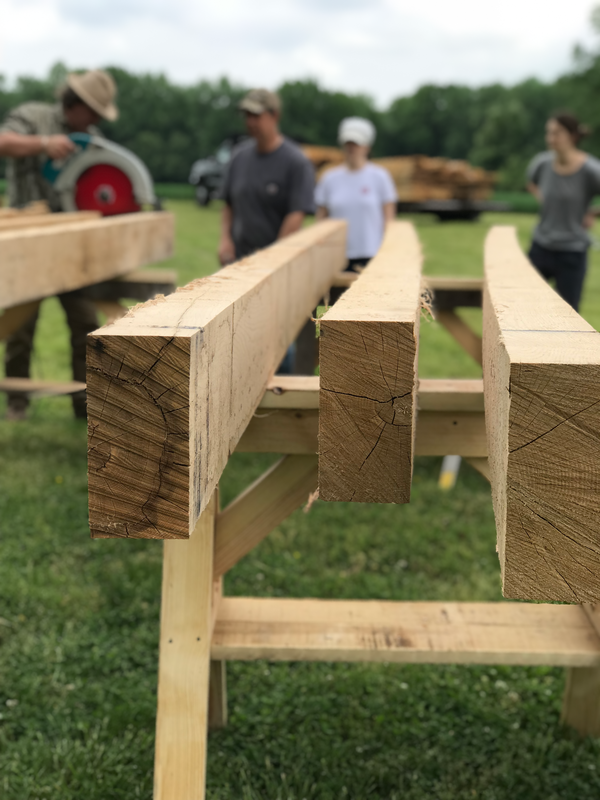 The structure we were erecting is a reconstruction of enslaved worker housing, which would have been built by the enslaved laborers themselves. Building the Ghost Structure was really hard work, even with the aid of modern tools, which were of course not available in the eighteenth century. Working on the Ghost Structure this week made me think hard about the people who built the original cabin on this site and so many others across the country. The Ghost Structure is a powerful building that conveys some of the important and sobering history of American slavery, and I hope it will be a really useful interpretation and education tool for the Menokin Foundation going forward. Thank you to everyone at Menokin and to the amazing Salvagewrights building crew for making this experience possible! 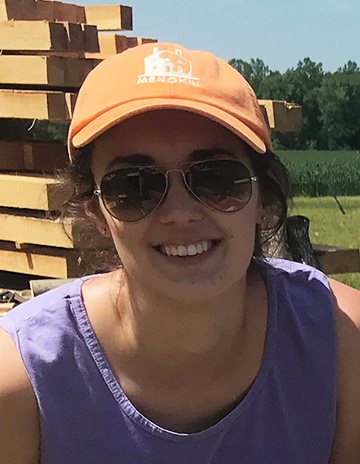 AMELIA HUGHES IS AN ARCHITECTURAL HISTORY STUDENT AT THE UNIVERSITY OF VIRGINIA. 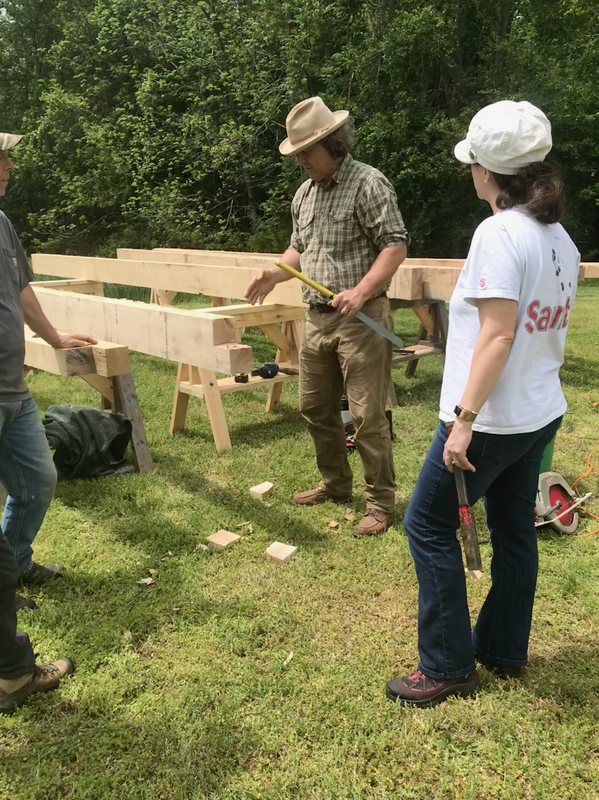 Earlier this Spring I was very fortunate to have the opportunity to spend two full days working with a crew at the Menokin site in Warsaw, Virginia to build a reconstructed slave dwelling on the site where one of the historic plantation’s slave cabins had once previously stood. The actual building of the structure was an effective blend of traditional and modern tools and techniques. At Menokin, the crew employed a combination of both modern and historic building technology to achieve the end result of the slave dwelling structure. I found this juxtaposition between eighteenth and twenty first century technology to be very intriguing. 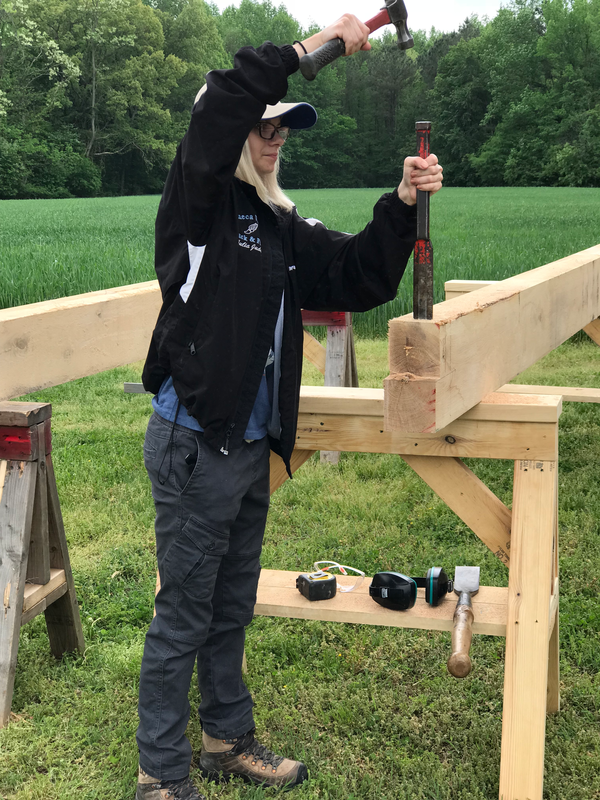 Throughout the two days that I spent working with the crew, I was able to gain experience using both modern power tools and hand tools, some of which were themselves antiques forged by blacksmiths. 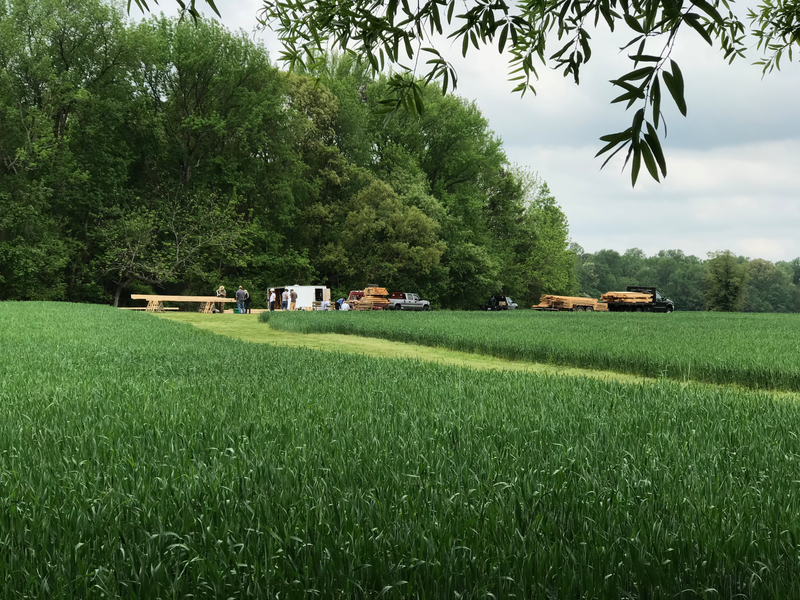 I appreciated the way that the crew used modern time (and therefore money) saving tools while still using traditional methods for many aspects of the construction. In one instance in particular, this blending of modern and traditional tools especially stood out, and that was in the creation of the mortis and tenons used to construct the building. 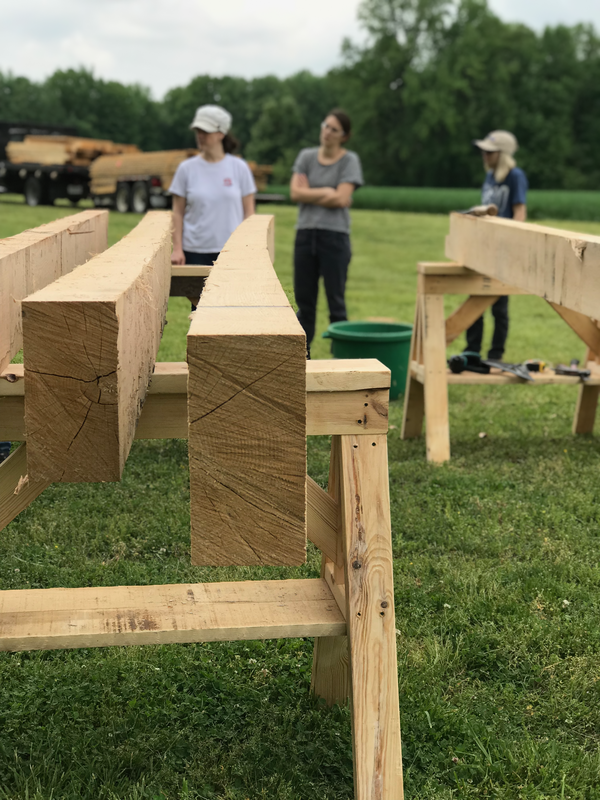 The first step in the process was to create mortises in the cut lumber that the structure was going to be made out of. In order to do this, we used an electric powered mortise maker. 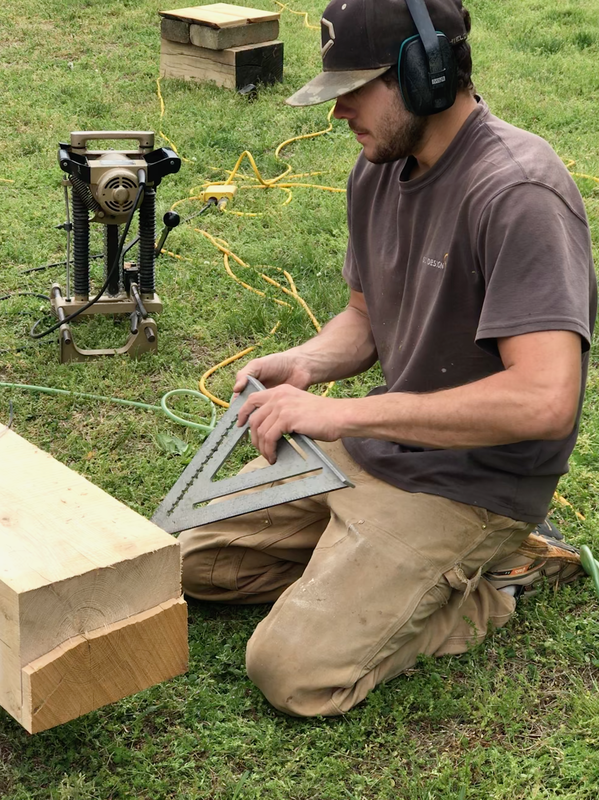 This tool is essentially a chainsaw oriented vertically in a frame that can be adjusted and pushed down into the wood to create a rectangular hole that serves as the mortise for the timber frame constructed building. 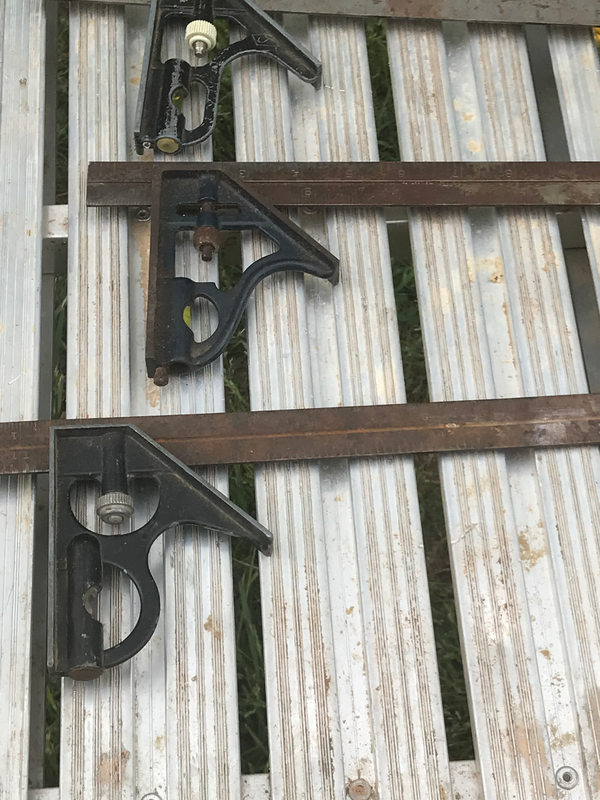 The tool, however, created a cavity with rounded corners and humps in the middle where the mortise machine could not reach due to it’s rounded blade. From this point, the most efficient way to shape the mortise was using the tried and true methods of the eighteenth century and prior – with a chisel. 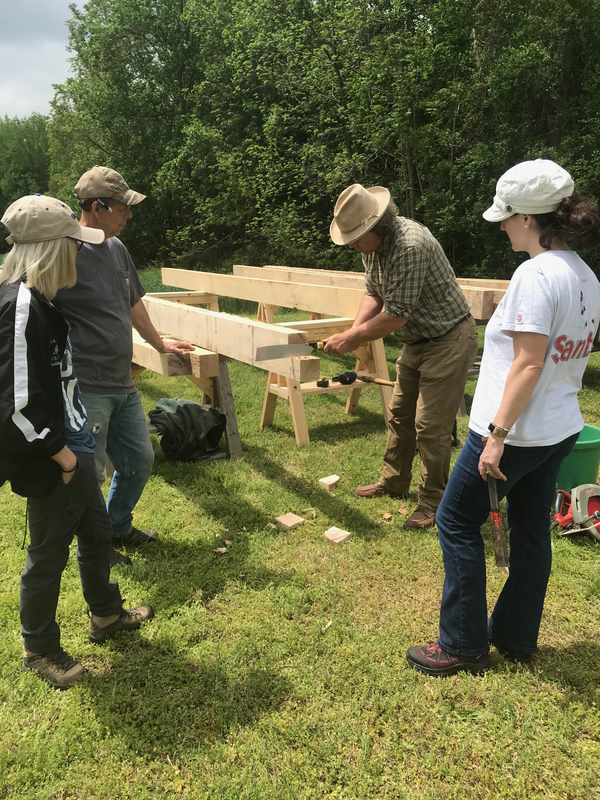 A chisel and mallet was the most effective way to complete the mortises and shape them into the required form in order to properly fit together with the tenons to create a secure joint. Effective, that is, if you are skilled in using a chisel and mallet. I however was decidedly not effective in my chiseling efforts, and it took me a great deal of time and effort in order to adequately clean out even one mortise. Chisels of varying sizes were actually one of the most, if not the most, used tools on site among both traditional and modern power tools. The chisel was also used to complete the tenons after they were cut out of the lumber with a circular saw. The modern power tools made for quick and easy work, but that was not precise enough to successfully complete the traditional construction techniques. 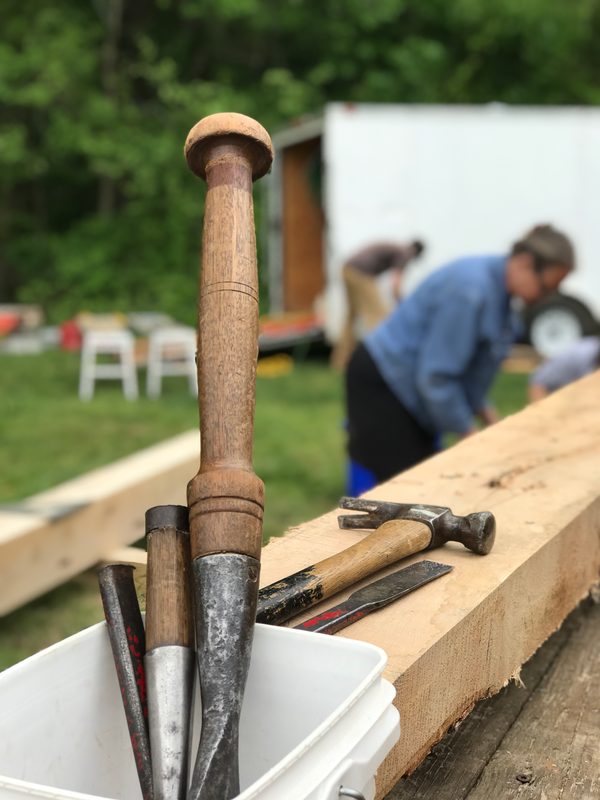 In order to properly execute the mortise and tenon joints of traditional timber framing, old-fashioned hand tools were needed to shape the joints to the point where they would properly fit together. This combination of modern and traditional methods really struck me. 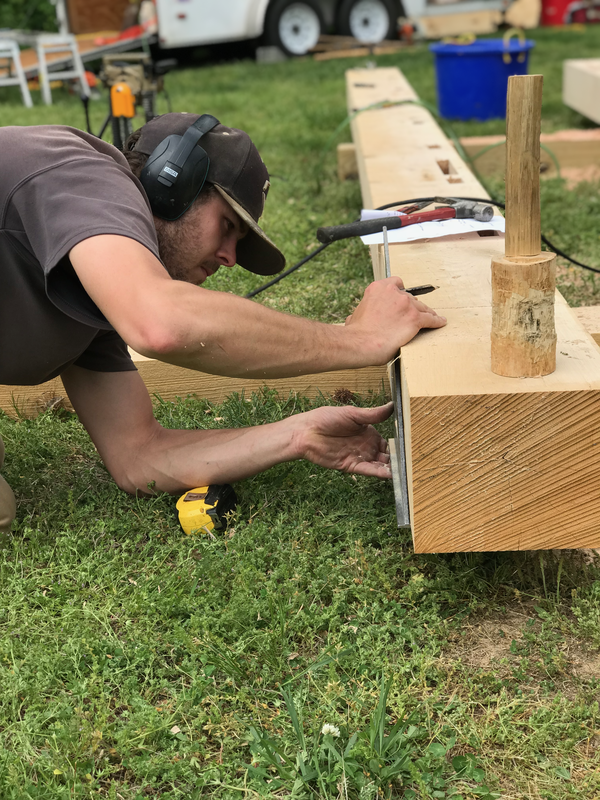 We can improve upon the building methods of the past using our current technology, but sometimes the best tool for the job is still the original tool, as was the case in creating mortise and tenon joints. The methods of the past sometimes can only be achieved using the tools of the past, despite our best efforts to cut down on the time and labor expended in the building process. This blend of historic and contemporary building was also apparent in little shortcuts that the crew took. 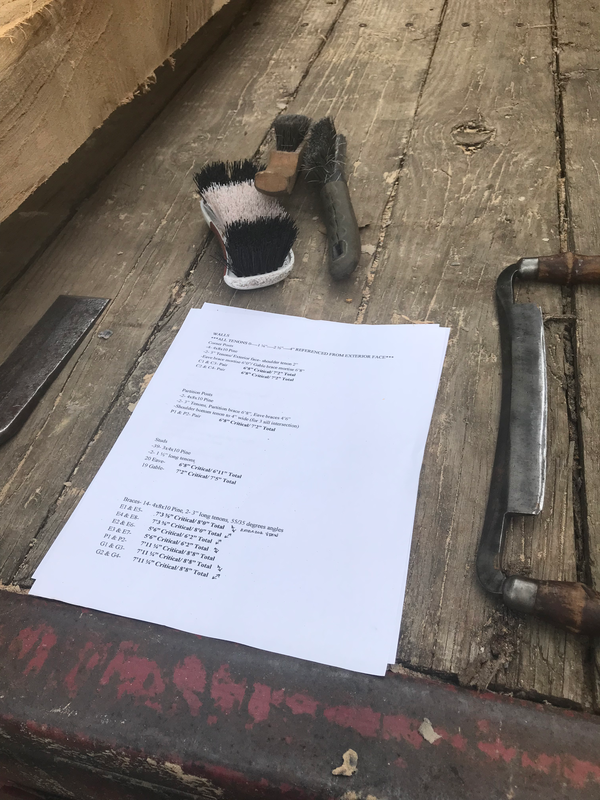 One example of this is that when cutting big pieces of wood out of the sills for lap joints, the crew made a few strategic cuts, gave a couple of whacks with the hammer, and out popped three blocks of wood that used to occupy the space that was now made vacant for the lap joint. Removing the wood in that way allowed it to break along its own natural path, making it easier to chisel the precise measurements needed and ensuring that the wood didn’t break or split due to unnecessary excessive pressure from a power tool on an a relatively small piece of wood. I appreciated the crew’s mix of old and new techniques. It seems wise to keep the best of the traditional methods while using available current technology to make the process more efficient. methods. Unfortunately, there was a bit of miscommunication and the majority of our pegs ended up being not quite wide enough, so we had to go back and shave off some additional wood with the band knife. The pegs needed to be long enough to go completely through one piece of framing and into the next, securely attaching them together. 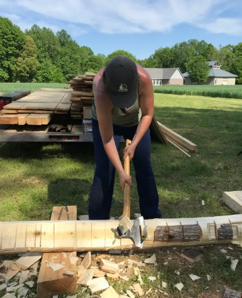 And so we learned the hard way the importance of triple-checking your work, especially when using labor intensive hand tools, by having to go back and alter fifty pegs by hand on the saw horse. 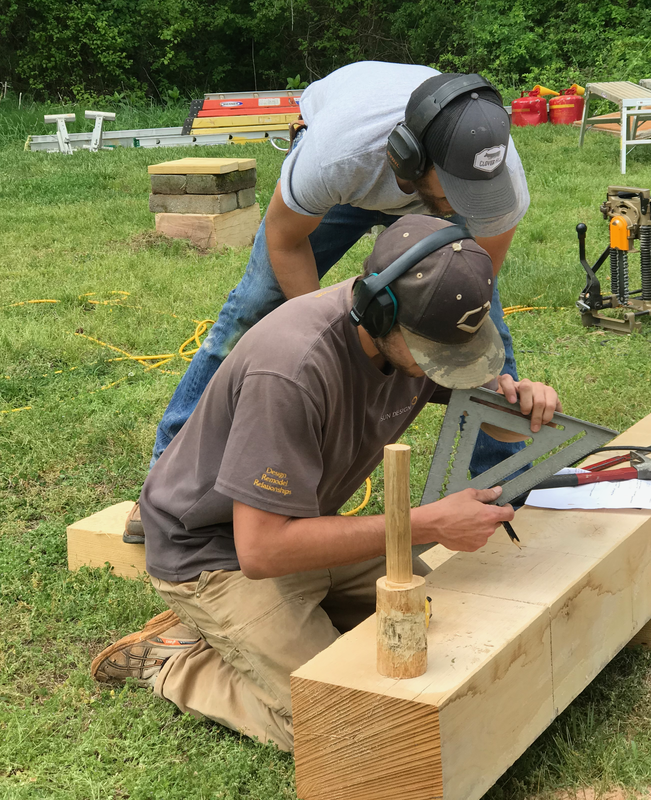 As was the case in working with wood in class, it was important to keep the characteristics of the wood in mind when manipulating it in order to create the components necessary for a timber frame structure. When we began making tenons to fit into our perfectly chiseled mortises, we had to keep the properties of the wood in mind. After carefully measuring out our tenon from the lumber that would soon become a wall stud, we set about cutting the shape out of the wood. Perpendicular to the wood we used a hand saw, but cutting parallel to the wood, we used a chisel to remove the small block from the larger piece. This was because it is most effective to saw against the grain as opposed to with the grain, and when going with the grain, the most effective tool is a chisel. In the work of constructing a building, it is always necessary for the carpenter to keep the properties of the wood in mind and work with those properties, using them to the carpenter’s advantage when possible, as opposed to against it. 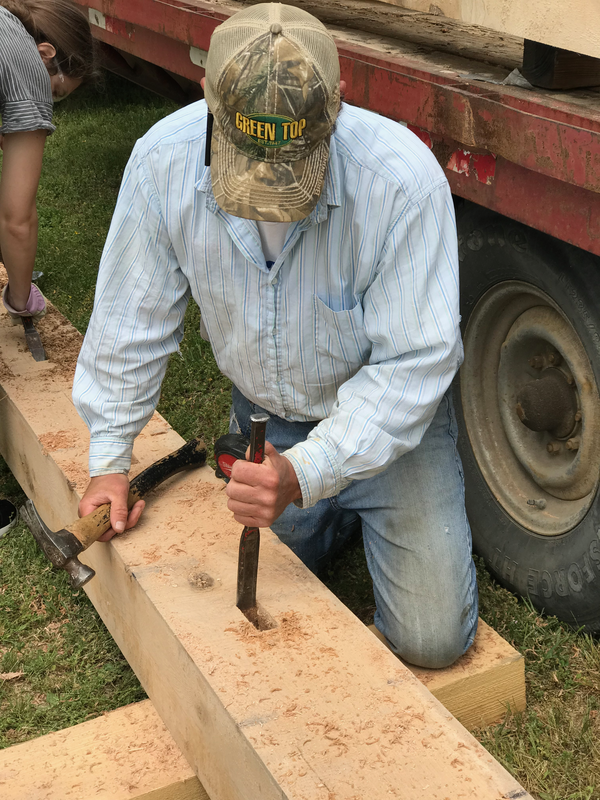 Throughout the days spent at Menokin working on the slave dwelling, we also learned some of the traditional hand tool technology that would have been used in creating a structure similar to what we were making. 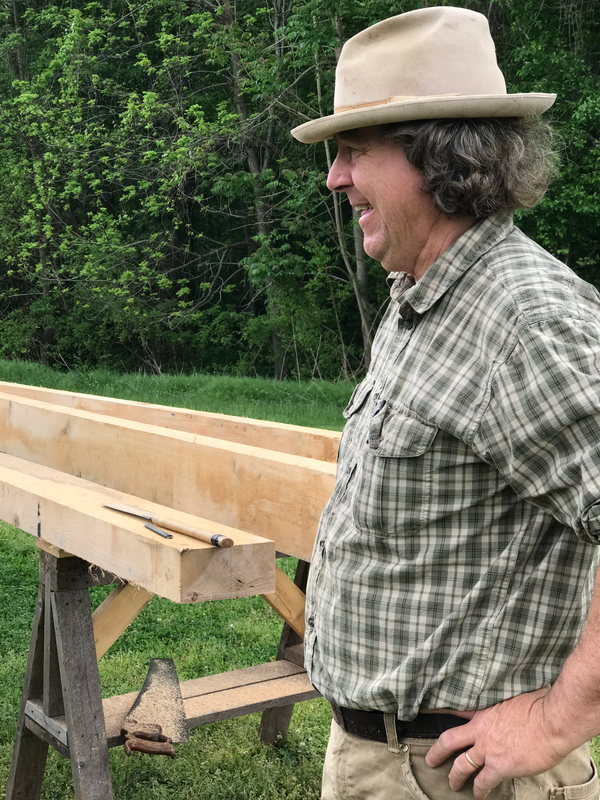 Craig Jacobs demonstrated, using antique hand forged tools, how a log would have been hewn into the type of usable lumber that formed the structure of a timber framed building. 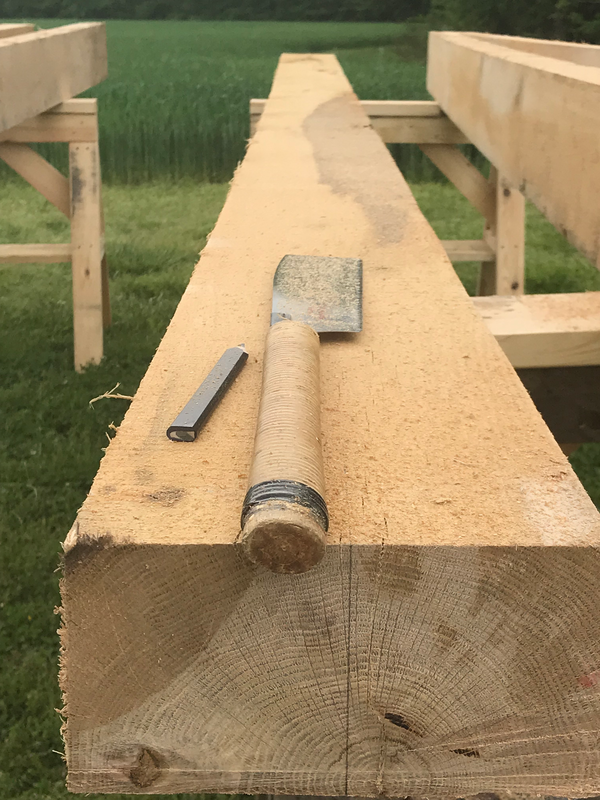 We learned about the process of scoring the log with an ax, “juggling” the resultant little mounds off of it, and then hewing that last bit to create a mostly flat surface. I especially liked the ax with an offset handle made for the last step of hewing. It is such a specialized tool but trying to hew that last bit with a regular ax was near impossible, and I have to think that the first few people to come up with offsetting the handle must have been amazed at how much easier that made the task, and awfully pleased with themselves for their innovation. 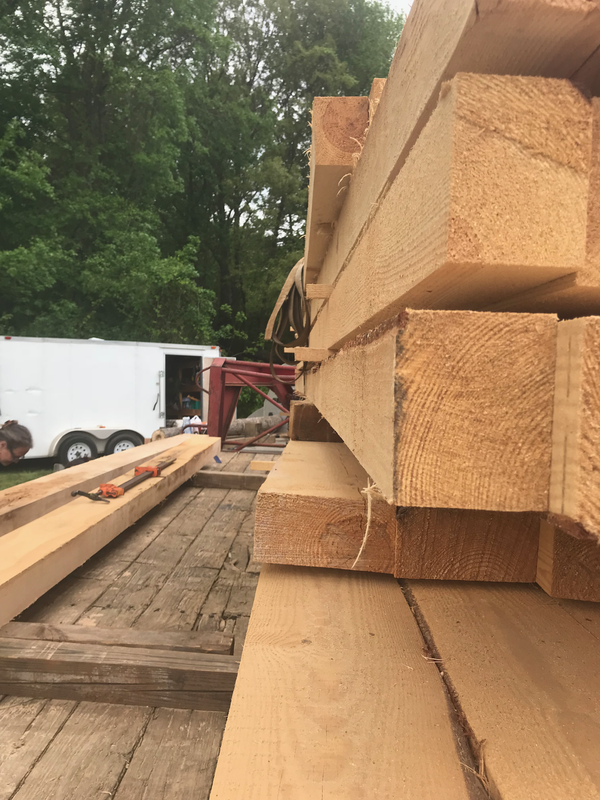 It was really interesting to see how the timber would have been made, and I think that Craig was a bit surprised when we told him that we wanted to try to hew a log of our own. Attempting to hew a log into usable lumber was incredibly difficult. But much like splitting a tree trunk using only wedges and mallets, it was also immensely rewarding. It felt really good to swing an ax and knock off a clean chunk of log almost flush with the chalk line. 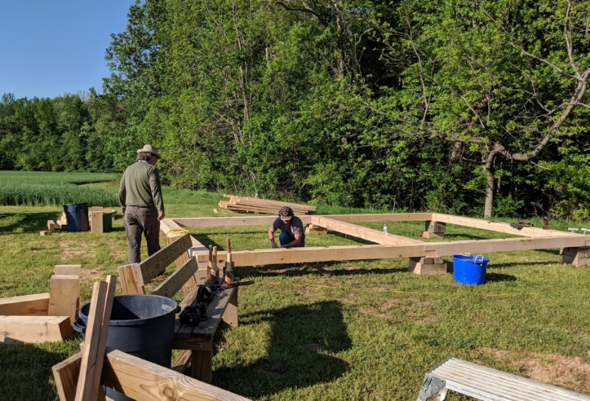 I have to admit that these moments were fewer than the ones of frustration, but the process made me really appreciate all of the skill and man hours that went into constructing timber frame buildings. All in all, I really enjoyed my experience working hands on with a modern take on traditional timber frame construction. Learning about how the pieces fit together in class is one thing, but actually seeing how it is built and watching it come together adds an additional depth of knowledge that can’t be gained any other way. I have such a greater understanding of early American building practices and how a timber framed structure is created. 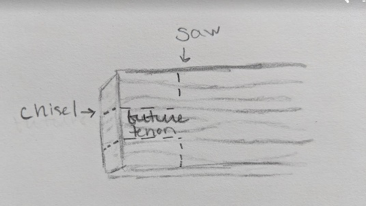 Understanding how tools are used to shape and manipulate the wood to fit together perfectly provides me so much context that cannot be grasped from simply reading about it. 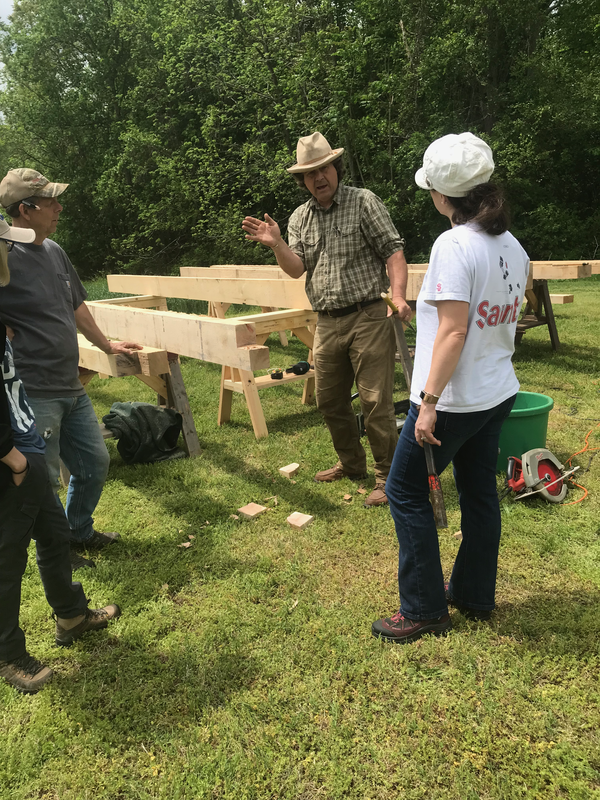 I am so glad to now have this deeper connection to and understanding of the process of creating timber frame structures and the skilled laborers who built them. I got home from Menokin on a Tuesday night, and on the following Wednesday I went to our neighborhood weekly meal at our common house, part of which is an old log cabin that has been added onto multiple times. I went into the cabin and looked at the timber, like I have many times before, but this time I noticed marks on the summer beam that I hadn’t appreciated before. They were the marks left behind from the hewing process, little V-shaped notches in the wood where the ax score marks had gone slightly past the chalk line, marks I had just made myself on a piece of timber at Menokin. And seeing those scars in the wood made me love that little cabin more than I ever had before. 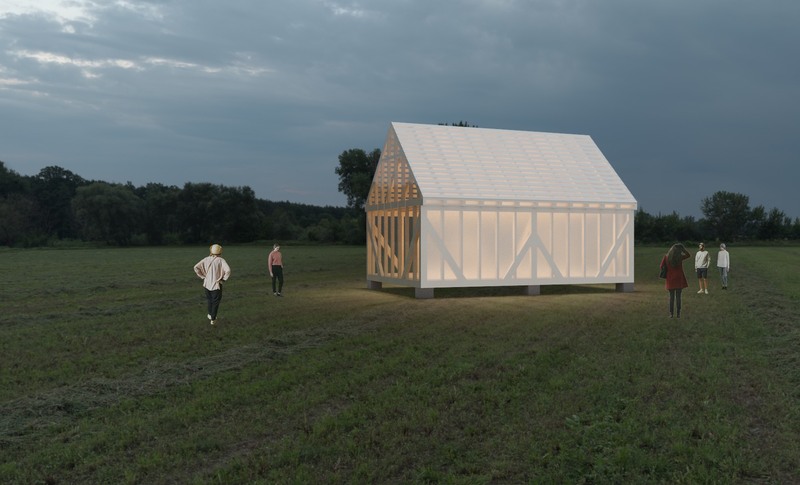 On the first day over a cool cast of clouds the project for the Ghost Structure of Menokin began to create the first replica of a slave dwelling that once was built on this land. The group was split up between two groups to start cutting the wood. Both groups would contribute in building the base of the structure. 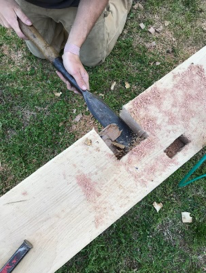 In order for the base of the structure to connect the joists must be cut into the wood. The joists are made up of horizontal timber and in our case, oak is being used as the base because this type of wood particularly is harder and will hold up the best support. 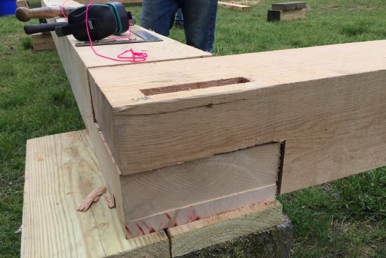 In creating the joists each end of the timber must measure 4” x 4.5” in the shape of an ‘L’. A japan saw is used to cut off the unwanted piece in 4 sections. Next, a chisel and mallet are used to break off the sections to create the final joist. Pictures below show the process of creating the joist. Once a 15’ x 25’ base is placed we began preparing the next steps in creating the floor of the Ghost Structure. The floorboards would be made of yellow pine and in order to align each row of the floorboards a hammer and chisel would be used to avoid any gaps in the floor. 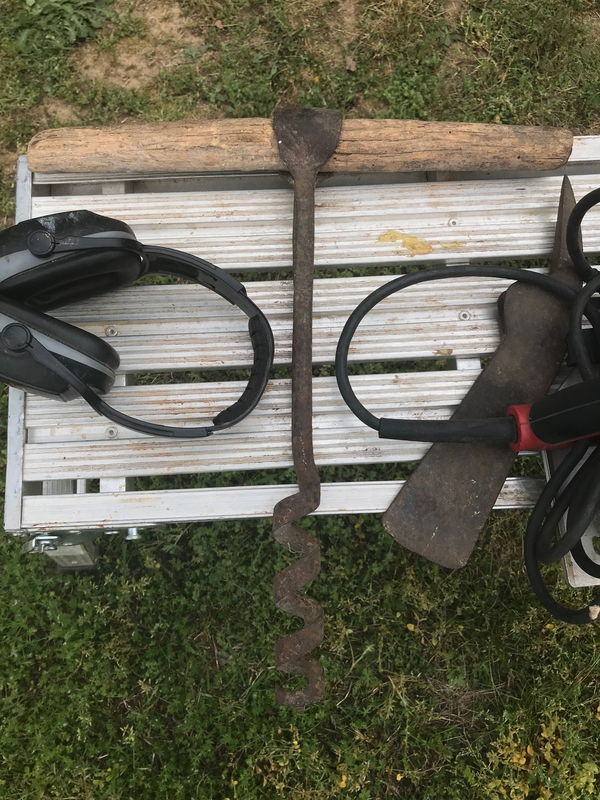 However, in the 18th century they would also use an auger that would create a small hole into the wood and another tool would be placed into the hole to wedge the pieces of wood together. An auger is a tool with a large helical bit for creating holes into wood. We know there is evidence in using an auger to wedge the floorboards together because of the circle marks left over by this tool. 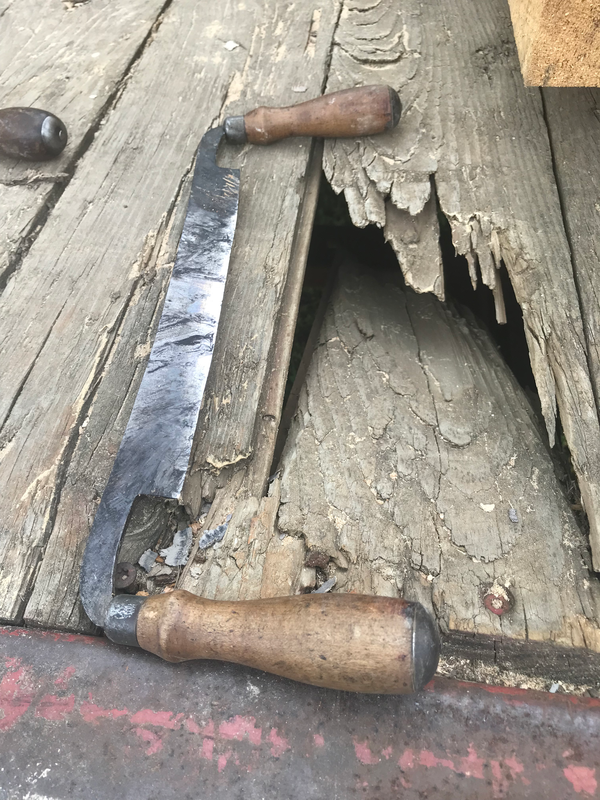 In our case, only a hammer and chisel were used to connect each floorboard together. Nails were hammered into the yellow pine to connect the floorboards to the base of the structure. Once a floor was established the frame of the Ghost Structure will become the next goal. Picture below shows finished floor. On the first day the other group was creating joints in the base for base to properly support the frame. 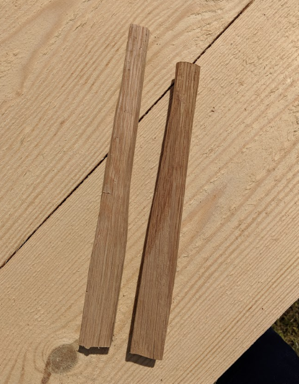 The joints are known as mortise and tenon and are adjoining pieces that connect at a 90-degree angle. On day 1, the mortise was first cut into the base to eventually fit the tenon to connect the frame to the base. Creating the main, vertical frame is what was being accomplished on day 3. This becomes the most structural support of the Ghost Structure. How would the mortises be created back in the 18th century? 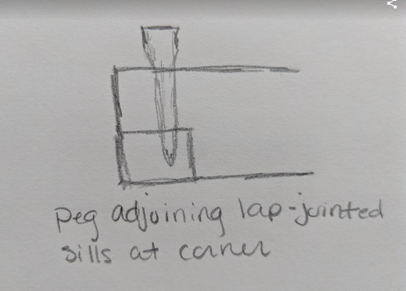 An auger would have also been used to create a hole for the tenon to be connected to. 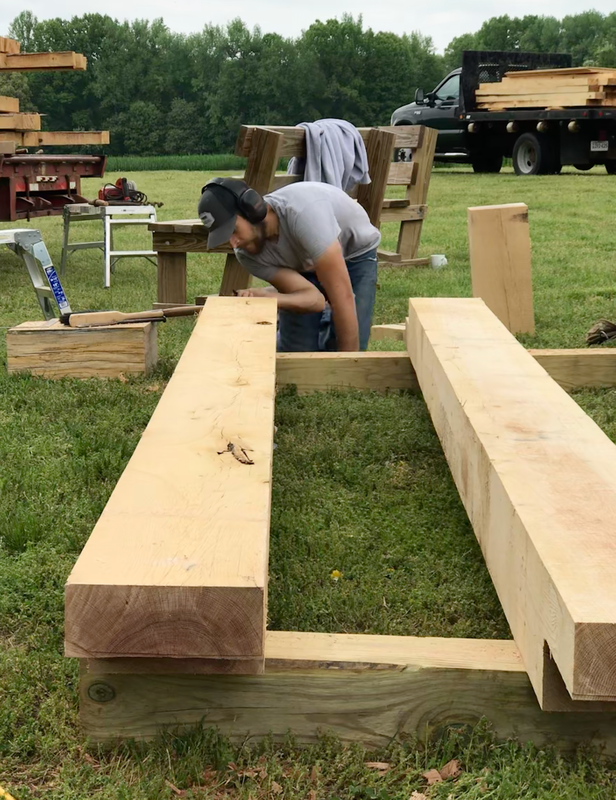 However, the auger would not penetrate entirely through the timber but a little over halfway through so when the tenon is created is has a stopping point. Picture below shows the joists creating the base and the main frame connecting to the base of the structure. Third picture shows how the tenon is being cut by using a japan saw that will fit into the mortise. Hand-carved pegs were needed to be made to act as the studs of the structure for better stabilization and support. By taking a long piece of yellow pine that measures roughly 1” x 1” and carving out the shape of the peg by using a tool known as a draw blade. The tool does exactly what it is named for. When using a draw blade, you hold onto the handles on each side of the blade and pull the tool towards yourself to smoothly shave off pieces of wood. 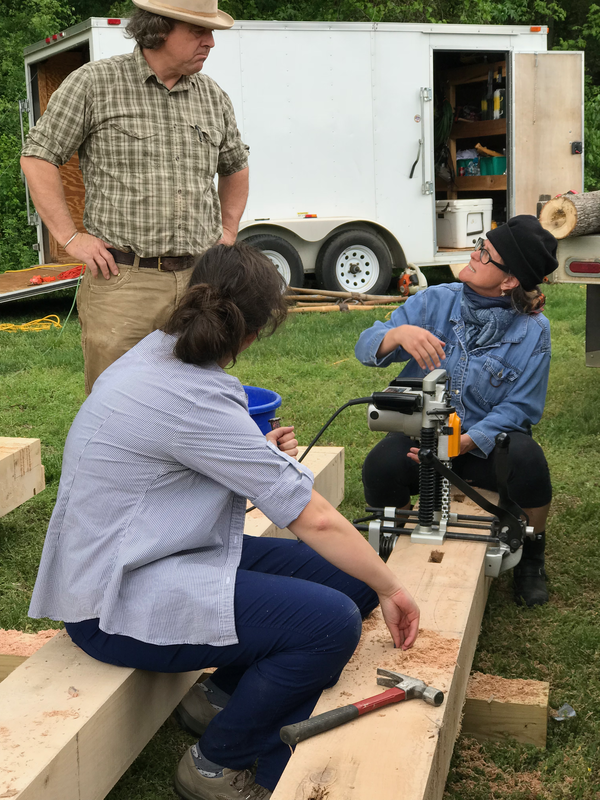 In our case, sat on a sawhorse that allowed us to clamp the piece of wood tightly so that the draw blade could easily be used. About 90 pegs were carved over the course of the week to be hammered into the Ghost Structure. After the pegs were finished, they needed to be hammered all around the base of the structure. An auger would have been used to initially created the hole for the peg to fit into. For the purpose of finishing the structure within the 5-day mark, a power drill was used. The pegs had to fit in tightly and once hammered in the piece sticking out of the base had to be sawed off using a japan saw to fit smoothly along the oak base. Once the pegs were placed the cripples had to be attached to the vertical frame. Cripples are a type of wall bracing that rests on top of the foundation of a structure. They support the overall weight of a building and must be braced so the frame does not collapse. 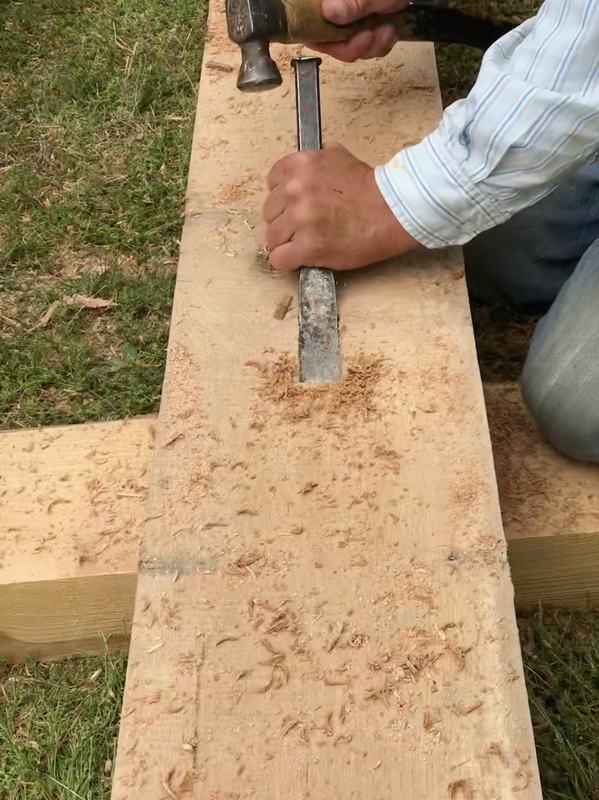 Both ends of the timber cripple are cut at a 45-degree angle and hammered into the frame. Pictures below show the drilling of the hole for the peg and then using a mallet to hammer in the peg to the base. The last photo shows how the cripples were hammered in with nails to the frame of the structure.